Licensed Bonded and Insured - Whats That? If you've ever embarked on a homebuilding, renovation, or repair project, you’ve probably been advised to hire only professionals or tradesmen who are “licensed, bonded, and insured.” But what exactly does that mean? And why is it important to you? Bonded. The word “bonded” in this situation is probably the least understood of the three words. First, let's look at the formal definition. The word "bond," as defined by Merriam-Webster, means: "an obligation made binding by a money forfeit;" and also "an insurance agreement pledging surety." The word "surety" means "one who has become legally liable for the debt, default, or failure in duty of another." There are many different types of bonds. In most instances, when you see the words "licensed, bonded, and insured" in an advertisement or on a vehicle of a construction-related company, the word "bond" generally refers to a license and permit bond, which is a type of surety bond. The license and permit bond guarantees the person or company that is bonded will abide by the terms of the license issued and the permit they have pulled. Some municipalities require contractors to have license and permit bonds. The requirements for this vary by state, parish, or city. Sometimes a permit bond is required only for certain work on a particular project. This bond requirement can also apply to homeowners who are working on home improvement projects that necessitate obtaining a permit from their municipality. Most construction related trades working in the residential sector do not carry bonds. It is rare for a home builder to be bonded. Bonds in the construction industry are more often found in commercial and government work. The typical bond is a performance and payment bond, a type of surety bond held on a construction contract. This bond pays if the construction company walks out on a job or produces sub-standard work or, alternatively, the bonding company will step in on the construction company's behalf. This bond also covers payment of subcontractors and suppliers, should the construction company default in this responsibility. Otherwise, the client is liable. Of course the bonding company will seek remuneration from the construction company. Unfortunately, the performance and payment bond is rarely found in residential work; however, by Louisiana law, a contractor doing residential work must provide the client with a home warranty of up to five years for an major structural defect, two years for plumbing, electrical, and HVAC system defects, and one year for any defect. Visit http://www.lslbc.louisiana.gov/pdf_files/NewHomeWarrantyAct.pdf to get the details about home warranties. Another type of bond is the crime coverage fidelity bonds, also called employee dishonesty bonds. These provide coverage for dishonest acts of the contractor's employees on the premises of the job and or in the process of conducting his job. These bonds are more commonly held by companies that provide janitorial services and the like, but more contractors are looking into this coverage. Normally the bond document is in the possession of the obligee - the person or institution requiring the bond. In the case of employee dishonesty bonds, the person or company who purchases the bond, for instance the contractor, will have the bond. Licensed. A license is a permit to work in a particular occupation as required by state or local legislation. Generally, to be licensed in the construction field means that the person you hire has completed a certain amount of education and training, been rigorously tested on this knowledge, and been approved by the state to perform the type of work on which they were tested on. (They may need separate licenses for different types of work.) In most cases it also means that the person you hire must keep up with current information and advances within his field through continuing education in order to maintain his license. Some fields do not require that their tradesmen be licensed, although much lobbying of the legislature for Louisiana state licensing requirements for these trades is ongoing. While this refers to state licensing, some local jurisdictions will require additional licensing for professionals to work in their municipalities. To learn which trades or professions require a license, and what type, explore our “Professional Roles” series on this website. To find if your jurisdiction requires additional licensing, check with your local government's building department. In short, you will want to hire licensed professionals because you know they have undergone extensive training and education in their fields. You should be able to expect a certain quality of experience and work from hiring those licensed. A word of caution: do not take the word of the professional. Always check with the appropriate regulating facility to be sure they are licensed and that their license is current. You may find this information for the regulatory bodies in our “Professional Roles” series. Insured. You want the company or professional you hire to work on your home to be insured to protect yourself from possible claims. For instance, suppose your builder is sawing a piece of wood for blocking. If the builder misses the wood and hits his finger instead, the company’s insurance will cover any medical costs. If the builder is not insured, your insurance may end up paying any medical and related costs. Most professionals are required to carry a certain amount of general liability and workers compensation insurance in order to get a license and be able to maintain it. Insurance is purchased from an insurance company to provide a limit of coverage to be available in the event of a loss. The company offers terms and conditions to you in the form of a contract to which you must agree in order to receive the coverage. This policy is held in the event a claim is made against you or if you need to make a claim that your insurance policy, or contract, covers. Claims are always investigated before the company makes payments. You want to make sure the company you hire carries workers compensation insurance as well. This insurance will cover accidents or injuries that an employee incurs on the job. Without this coverage, the injured employee can make a claim on the homeowner's insurance. Again, this is required of most professionals in order to become licensed and to maintain that license. The wise consumer will ask to see a copy of the insurance certificate and will check to make sure it is current. Be wary of anyone who "keeps forgetting" to bring this certificate for you to verify. But hiring a company or individual who is insured does not mean that you do not have to be insured yourself. When considering homebuilding, renovation, or repair, check your homeowner’s insurance policy so that you are clear on what your contract covers. You want to make sure you have general liability coverage and you may wish to purchase builder's risk insurance. Builder's risk insurance protects the structure from things like fire, tornado damage, and sometimes theft. If this is a new house being built and you are not living in the home, you probably want to look into this coverage. This insurance only covers the structure itself and those materials that will eventually become part of the finished structure. If you live in an existing home, but are building a house in a different location, you should contact your homeowner's insurance company to see if they offer extended coverage. With the right extended coverage, both the existing home and the one under construction will be insured. Either way, you might want to consider a builder’s risk policy for the home under construction. If you are renovating or putting an addition to your existing home, the type and amount of coverage you consider will be dependent upon the size and extent of your project. Regardless of whether you are building new or renovating, you will want to let your insurance carrier know and he or she can advise you on the best coverage for your situation. Recently, more builders have also started carrying errors and omissions insurance - a type of professional liability insurance. Many contractors give opinions and recommendations to the homeowner. They can be held liable for these recommendations. 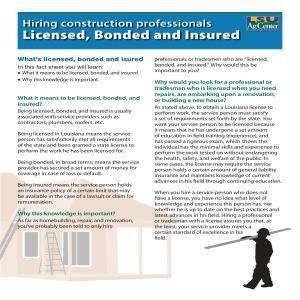 So now you know why hiring professionals or tradesmen who are licensed, bonded, and insured is important. Be aware that if you choose to hire someone who is not “licensed, bonded, or insured,” you will be taking all risk upon yourself should anything happen. Audio clip: Is there anything I should check besides licensed, bonded and insured?